There are some opinions that a shower booth is even more convenient if designed as a combination of a shower and a bathtub. Such models have really become popular lately. However, there are also opinions that a shower/bath hybrid is worthless as one can always get a shower booth with a deep tub, and it will be just enough. Which is a better option? What installation is easier? Who to contact for hybrid installation services? Let’s get into some details. First, you should pay your attention to what a bathtub enclosure looks like. Nothing really changes. There are simply bathtub walls present and a shower head is attached to the back wall. On the other hand, a shower booth with a deep tub can be a completely closed construction with four walls and even a roof. These models are usually large. But getting one you will never have to worry about any leaks. Bathtubs always take more space than shower booths. In this case, though, there is no big difference. Both variants better fit spacious bathrooms, where big models can be easily and conveniently installed. You surely need to consider angle bathtubs and shower booths if you are a small bathroom owner. It’s a better decision for those who want to save some space. Everything is quite obvious. You will only be able to lay down and enjoy a bubble bath or a salt bath if you choose a shower booth with a bathtub. Shower booths with deep tubs, however, are not designed for laying in them (little children could try though) as it’s not convenient to do so, especially if you prefer relaxing in your bath after a long work day. You should also remember about all your family members’ bathing comfort. Elderly people and little children experience difficulties getting into a bathtub without help. Thus, shower booth with a deep tub will be an ideal option for them. You should always consider those you share your home with. Both bathtub enclosure and shower booths installations are time-consuming. They require effort and special skills to get installed correctly, therefore, it’s better not to do it on your own. Also, it’s really easy to damage a bathtub if you try to install it yourself instead of ordering professional services. 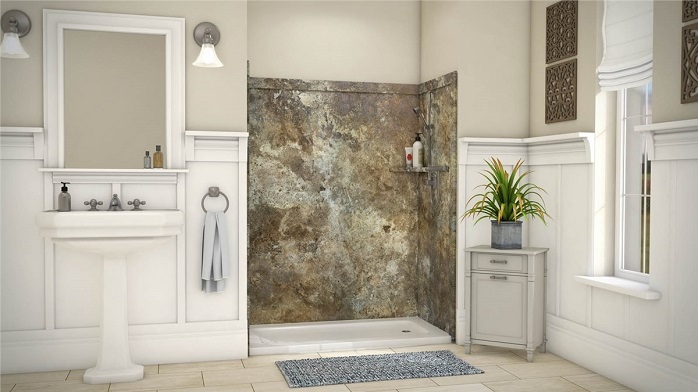 Miami Bathtubs Company will easily install your shower booth with a deep tub or your shower/bath hybrid. Just call us to schedule a good day and time for services. We are waiting for your call!